You guys. It’s finally Saturday. This week has just dragged on and on and on. You know, the way weeks tend to drag when you are really looking forward to something on the weekend? Well, tomorrow, J and I leave on a 7 day cruise and I am so, so ready!! This will be our first “official” vacation, aside from the quick trip we took to Colorado back in 2013. I’m still baffled at how long it’s been since I’ve been on a real vacation, being the little travel bug that I am. But, such is life, right?? Our cruise goes to Honduras, Belize, and Cozumel, and our friends are getting married the second day of the cruise, too!! J has never been on one before, so I’m excited for him to experience it. I’ve been on one, yeeeeeears ago with bestie T, and we had a blast. That was only 5 days, so I’m interested to see how 7 days on the big boat go. Cozumel was one of the stops on my first cruise, but Honduras and Belize are new destinations and I’m super stoked to visit these new places. And try the food there, of course. It’s been awhile – ok, a long while – since we had a Sammich Saturday post, so I thought that is what I would give you before I leave. And it’s a good’un, too!! Who knew all the ways you could use chimichurri??? That’s some good stuff, y’all. Gooooood stuff, indeed. And of course it doesn’t hurt that it’s piled on top of some delicious steak, with tangy dijon mustard, and squished between some little slider buns! I love sliders, anyway, but I just had a feeling that these were going to turn out mighty fine. And I was right! The flavors all melded so well together and made each bite juuuust right. Try it. You’ll see. And then I’ll come home to all sorts of fabulous comments and messages about how delightful these sliders are. Right? I knew it. So, Bon Voyage, my friends. I’ll see you back here in 7 days!! Well, maybe I’ll leave a few posts for you while I’m gone…you’ll just have to come back and see!! Season your steak with the salt, pepper, and garlic powder. Cover or wrap in plastic wrap and refrigerate for an hour. Meanwhile, combine the parsley, cilantro, garlic, and oregano in a food processor. Process until the garlic is minced well. Place in a small bowl and set aside. In a separate bowl, combine the remaining chimichurri ingredients (olive oil – red pepper flakes.) Pour over the parsley mixture and mix well. Taste and adjust any seasonings as needed. Preheat a grill or grill pan over medium-high heat, spray with cooking spray or rub with olive oil. Remove steak from the refrigerator and cook for 2-3 minutes per side, or until your desired level of doneness is reached. At least a little pink in the middle will yield the best flavor/texture. Remove to a cutting board and allow to rest for 5-10 minutes before slicing, against the grain, into 1/4-inch slices. 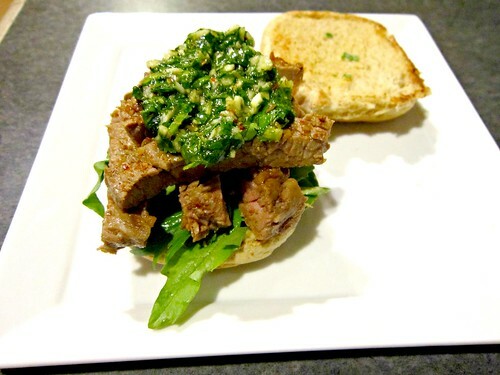 Toast your sliders buns, spread dijon mustard on the bottom buns, top with steak slices, a generous heap of chimichurri,salad greens, and the top buns. Serve with sweet potato fries or your favorite side.